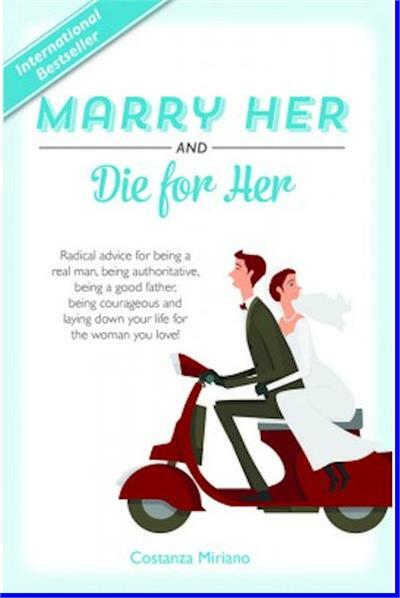 Marry Her and Die for Her, Costanza Miriano, Hardcover, # 65460, 216 pages. ARE You REALLY CALLED TO Die For Her? You better believe it! What else is man made for, but to die for a noble cause…? The good of your wife (and your family)? Well, there aren’t a whole lot of better causes out there, are there? • Remember how much your wife liked flowers, compliments, chocolates and romantic dates when she was your girlfriend? Guess what? She still does. or at least she shouldn’t, and neither should you. • The old saying goes: “Lead, follow, or get out of the way.” Never mind that…just lead! The other two are not options. Democracies are fine for countries—some of them—for families, not so much. • Be there. Turns out the old saying is true…showing up IS half the battle. • Oh, and lest we forget…if you haven’t done so already, Marry Her!